Having never visited Durham, I wasn’t sure what to expect when traveling from Raleigh-Durham International Airport to the downtown. After a brief, 20-minute drive through some business parks and residential areas, what my Uber driver called a “short cut,” I was pleasantly surprised to wind up at my hotel in a walkable, charming downtown with lots of dining and shopping options and a nice amount of activity — plenty of couples and groups walking around to and from various eateries and bars, but nothing overly loud or rowdy. The Unscripted Durham Hotel has a ton of character. The blue-and-white facade is reminiscent of a Mid-Century motor lodge and for a good reason — the hotel was previously the Jack Tar Motor Lodge, harkening back to previous decades when road trips were more popular and Durham was a spot on the map for those traveling on the East Coast. Even with its rich history and interesting past, though, there’s nothing outdated about this hotel. 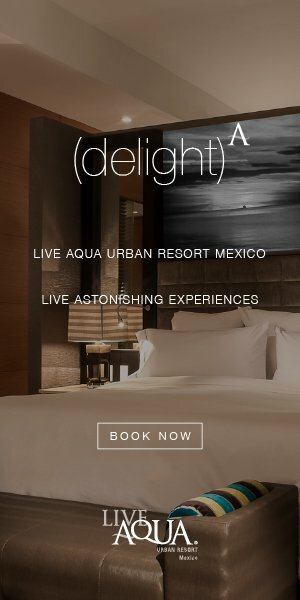 The first Unscripted-branded property from Dream Hotel Group, it boasts a unique feel you won’t find in many other hotels, regardless of how design-driven they might be. The 74-guestroom property has a retro-mod style mixed with certain modern accents, ranging from vintage-style furniture in the lobby lounge, The Studio, juxtaposed against graffiti art on the wall, to Mad Men-esque wallpaper in the guestrooms alongside sleek, white-on-white bathrooms. I had a studio king room on the second floor (there are only four floors, with the third and fourth dedicated mostly to the pool deck, which welcomes both locals and visitors alike in the summer, as well as DJs on the weekends). Spacious, my room opened to lots of storage and a long desk area on the left, before shifting with the room’s L-shape to include a small seating area with sofa, large bathroom accessed via a sliding barn-style door, and a king bed against a bright accent wall. The two exterior walls featured windows all the way around, letting in a huge amount of natural light. My guestroom was more than enough space for one person, and I could see it being perfect for two or even three travelers. It was also quiet and, even though there were others staying near me and I was on an outside wall, I barely heard a peep. I could imagine that would be a different story if you had a room on the third or fourth floors (which, by the way, open right out onto an exterior walkway that faces the pool deck, in the style of a retro motor lodge), but those rooms also come with their perks — you’re right near the action and you have easy access to a sunny summer spot, perfect for a girls’ trip or a couple looking to have a great time. There are several different sizes and styles of rooms, but none are overly small and the design of each prevents any from feeling particularly cramped. There are some interior rooms without windows, but again, the design does a great job of preventing the rooms from feeling dark or claustrophobic in the slightest. The hotel’s common spaces include a 24/7 fitness center the staff assures is generally quite free, so you never really have to worry about waiting for a piece of equipment. The Studio is designed with socialization and mingling in mind, so you can feel comfortable working on your laptop during the day, and also chatting with your fellow travelers over a drink in the evening. The coffee-turned-cocktail bar, allday, is just off the lobby as well and, as I was pleased to find during my stay, the bar menu features a delicious Old Fashioned. There’s not an extensive sit-down dining option in the hotel itself (though you can order a light, limited selection from allday), but there are several other eateries within the same building, so you only have to walk a few steps to grab a meal or drink any time of day. My favorite? Jack Tar & The Colonel’s Daughter, which serves upgraded diner food and Southern favorites that are delightfully upscale. Expect a high-end culinary experience in a comfortable and low-key environment.